OM4 SC to SC Bend Insensitive 40/100Gb 50/125 Multimode Duplex Laser Optimized fiber optic cable with ceramic ferrule SC connectors. A high bandwidth 50um, multimode fiber jumper allowing extended reach upwards of 150 meters at 100 Gb/s for ultra-long building backbones. An aqua colored, zip-cord fiber optic patch cord with 2.0mm outer diameter PVC riser rated jacket. OM4 SC to SC Bend Insensitive 40/100Gb 50/125 Multimode Duplex Fiber Optic Cable. 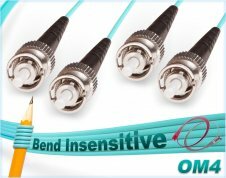 Accelerate your network performance and accommodate tight bend environments with the Bend Insensitive OM4 Laser-Optimized Fiber Optic Patch Cable. This Bend Insensitive, aqua colored, 2.0mm outer diameter duplex fiber cable is terminated with 2.5mm SC ceramic ferrule connectors with easy to grab clips. TAA Compliant and designed for 40GBase-SR4 and 100GBase-SR10 ports and equipment. Supports high speed 10/40/100 Gigabit Ethernet, Fibre Channel and OIF applications. As expected quality for my install.